diy studded bag tutorial by makery mill. crafts and baking classes. Studs are everywhere at the moment, adding that edgy look to shoes, bags, tops and jackets. I bought these gorgeous round chequered effect studs from JosyRose, it was a tough decision – there are so many to choose from out there! This tutorial talks through how I gave an old H&M bag a new lease of life, but claw-backed studs are so easy to apply, the only limit is your imagination… How about adding studs to the shoulders of a soft jumper, or revamping a tired belt? 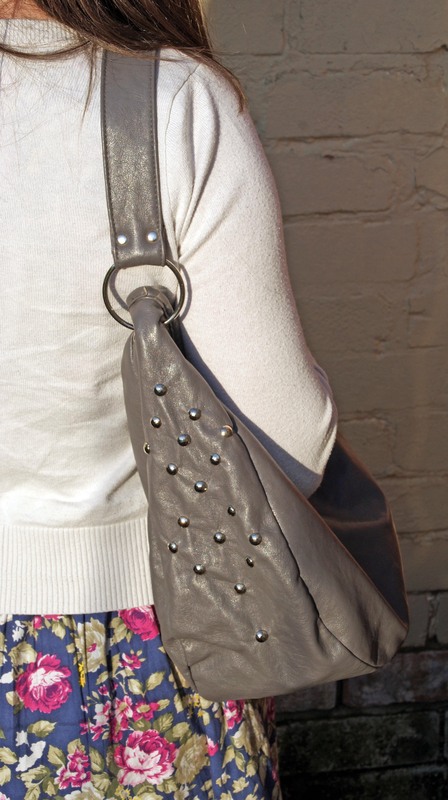 You will need: A plain old bag, or similar Claw-backed studs A thimble How to make: Lay out the bag, and with lots of studs to hand, play around with different designs. Make a note of your final design with a photograph, or by marking the material with chalk or a biro pen. Put the studs to one side, in the same layout if possible. One by one, attach the studs to the bag. Position the stud in place, then firmly push through the bag material. On the inside of the bag, push the material around the stud claws down, to fully expose the stud. Take care not to hurt yourself here. Carefully push the claws down into the centre, using the thimble, or the back face of some scissors. Repeat for all the studs, working in a methodical way to layout your pattern. Enjoy the compliments, smug in the knowledge that you are now the owner of a completely unique accessory! This entry was posted in Crafts, Leamington Spa, Tutorials, Warwickshire.